I hope you are confused by the title of this post. I’m sure you are asking yourself, “Isn’t the summit the high point?” In most cases, the answer is yes! 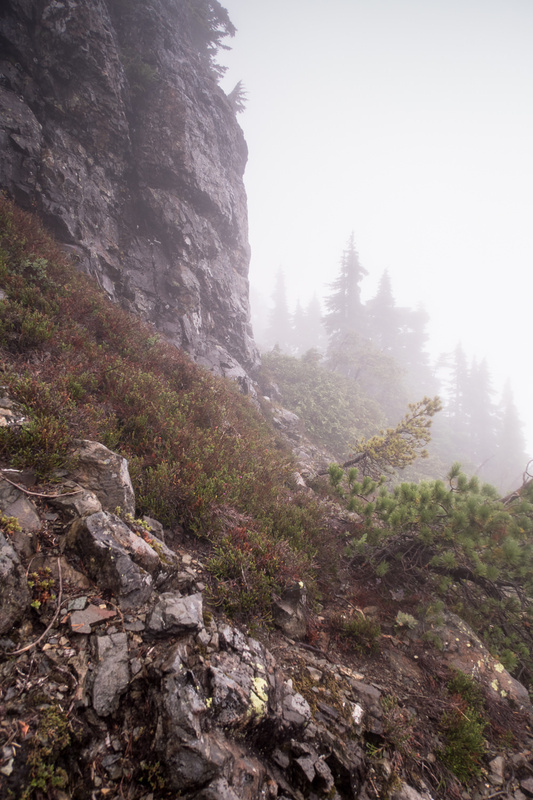 However, on Vancouver Island the answer is probably “Who knows?” The more I hike and climb, the more I am made aware of the inability of my maps to give me the true summits, show me all of the crucial details regarding elevation change, or even report accurate elevations for summits. We most likely attribute these inaccuracies to the original surveys done of the local peaks. A great example of this is the unnamed peak commonly referred to as 1920, so-called as it is marked on the map as being 1920 metres high. In actual fact it is 1931 metres, though in this case the high point is marked as the summit. A second example is Mount Rosseau, where the summit is incorrectly marked. The point is placed in a col between two bumps. Both my GPS map sets have this inaccuracy. Mount Kitchener, in the Prince of Wales Range, has similar issues. The high point is quite a distance from the summit, and involves significant loss in elevation before climbing back up to the summit. Because of these factors, it’s possible to do the summit without hitting the high point. Looking for a great way to end the summer, Phil and I hit the road early on Saturday, August 29th. Our intention was to do a multiday, multipeak trip. We made our way to the trailhead of Mount Kitchener, our first goal. Our research indicated the road was in great condition, and we anticipated no problem driving to the parking area. The hike itself was reported to be easy and trail-like. We found one of these two statements to be true. 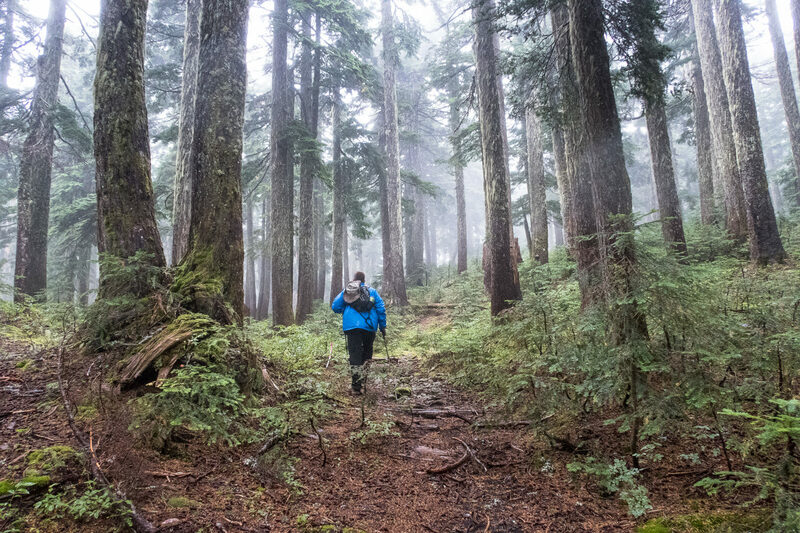 We accessed the trailhead via Big Tree Road, about 40 kilometers from Campbell River. We turned right off the highway and drove along the logging road. The directions to the trailhead are confusing, because there are some new unmapped roads, while some of the old roads are no longer active – for the best directions, refer to my GPS route. We found the road in worse condition than our research had indicated. Multiple cross-ditches mar the road, many of them deep. The Outback didn’t make the trailhead, and we stopped at 820 metres in elevation. Even getting my car that high up the mountain required some fancy wheel work and a willingness to let my bumpers scrape the ground as we worked through the cross-ditches. We parked the car and set out on foot to find the trailhead, just two kilometers, and 200 metres of elevation gain, farther up the road. 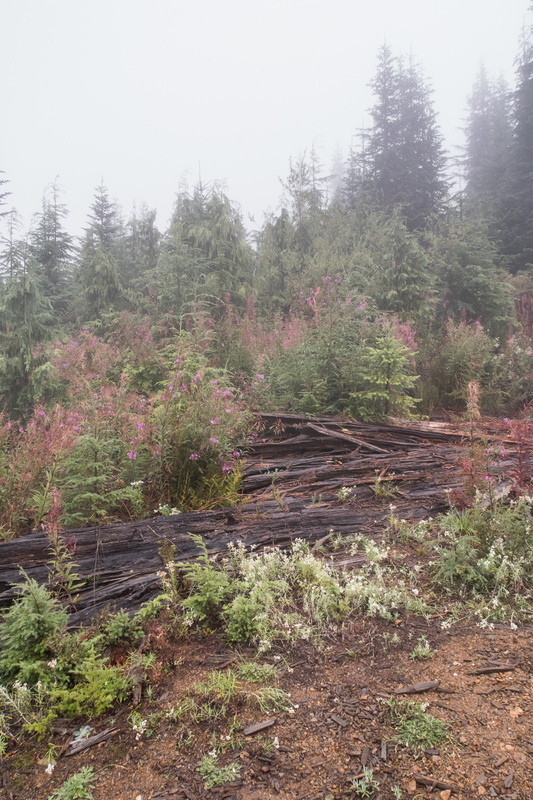 The trailhead starts at the terminus of the logging road, which ends in a wide area suitable for parking. rain that fell in the morning – a rain that would persist for much of the day. We were soaked in no time. you make your way up. 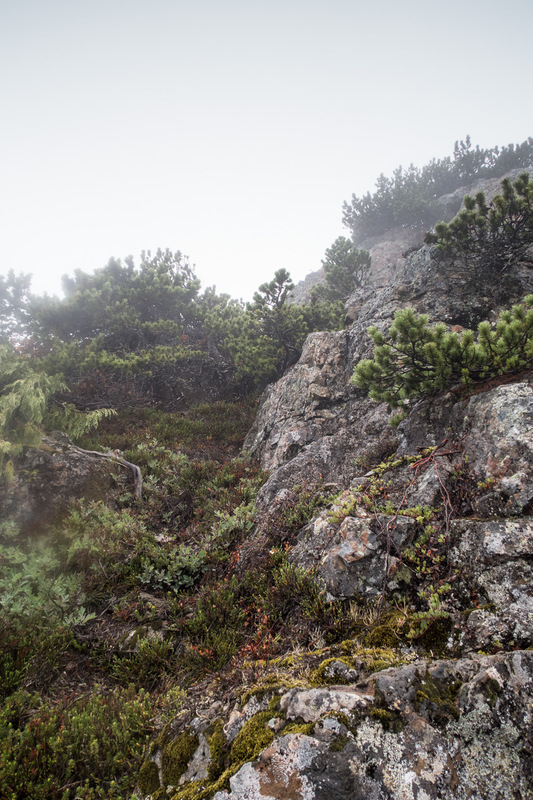 Around 1340 metres, about an hour and a quarter from the car, the trees gave way to open rock terrain. I expect the view would be great from here, but the clouded rainy skies revealed nothing. To add insult to injury, as we hiked into the open terrain, strong winds cut past us and drove the rain against us. 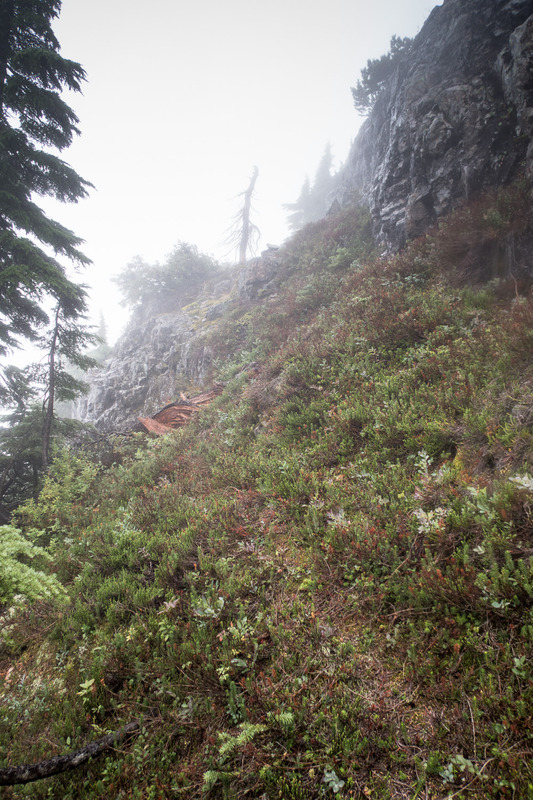 We stayed low and continued north through a section of busy Douglas fir, which brought more wetness. We continued on a northerly route between two bumps, and down easily-walked, plant-covered, rocky slopes. The route remains lightly flagged and partially booted as it takes a left hand turn up to the peak, which is marked as the summit. Though a repeater cone graces the summit (1431 metres), we didn’t see it until we were practically upon it due to a small copse of trees and poor visibility. We spent all of two minutes at the summit, as the rain pummeled us and the wind raged. We considered turning back, but felt we couldn’t justify the three hour drive up-island for such a short hike. We were determined to stand on the high point, so, navigating by map and GPS, we departed the summit over the northwest side. We used a series of ledges and short gullies to descend about 70 metres in elevation, to the saddle between the two peaks. 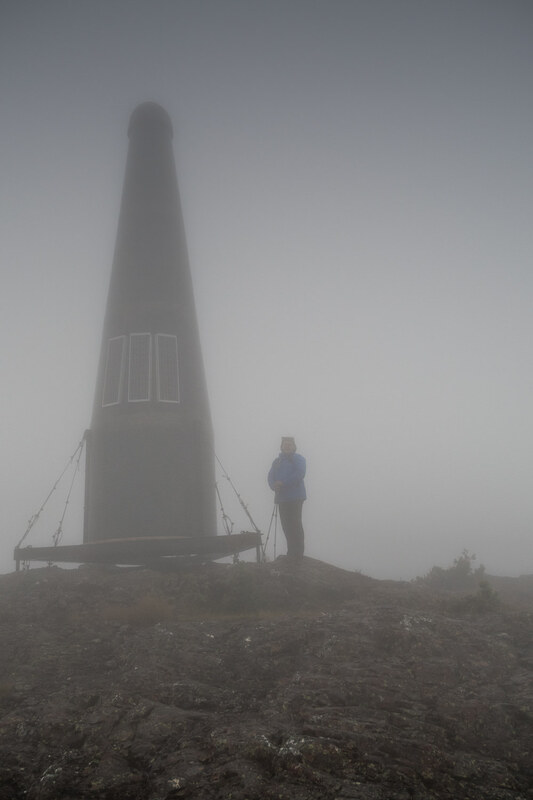 Even knowing we were close to our goal, we could see nothing – the high point was obscured in the mists. Ascending the final peak was the greatest challenge of the day. 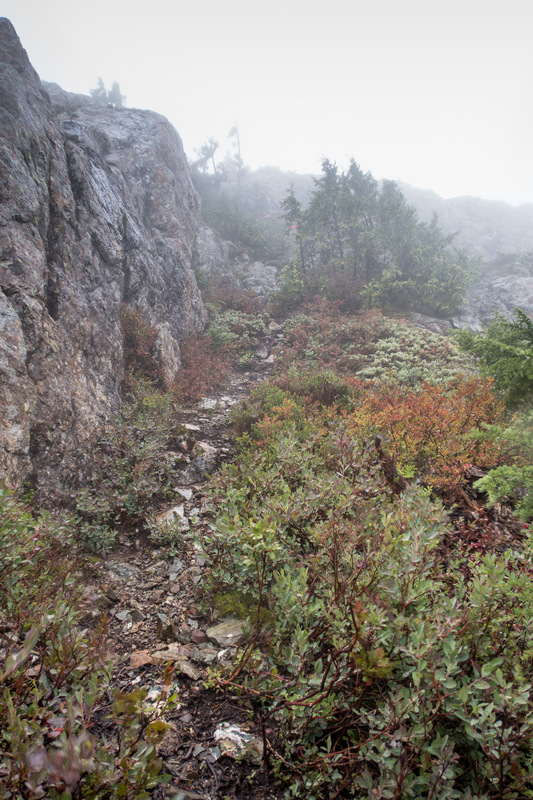 There is an established route that wends its way up the mountain, but at some point, we lost it. We arrived at a large wall of rock, and mistakenly moved left up the rock and roots – definitely beyond scrambling. Once past the bluff, I followed a ledge around to the right and picked up a flagged route that would lead to the main summit. The route is short but somewhat challenging to follow as it includes rock ledges, pushes through stunted trees, and sometimes requires the use of hands on trees to reach the summit. On a dry day, it may even be enjoyable; with the cold and wet of this day, it was onerous. Regardless, we arrived on the summit … with no view. We took our photographs, snacked, and descended. On our descent, we followed a better route down a steep grass gully. In the wet conditions, my shoes had a challenging time finding purchase, so I made use of the ample foliage to lower myself down. We discovered that the gully contained flagging, so we followed it to rejoin the route we had followed on ascent, right below the rock we had mistakenly scrambled up. The remainder of the hike followed our route up, with a few detours. We stopped off at one of the other bumps, just to make sure we had hit each of the high points on the ridge. As we walked the final stretch of road back to the car, the clouds broke, the mists moved out, and warm sun shone down on us. By the time we reached the car, my jacket was dry. In the end, we decided against the multiday trip. We checked the forecast and it called for an excess of 150 mm of rain; wet by even a lobster’s standards. We cut our losses, and made it home before dark. For those who are interested in doing this hike, take note that now is the time! 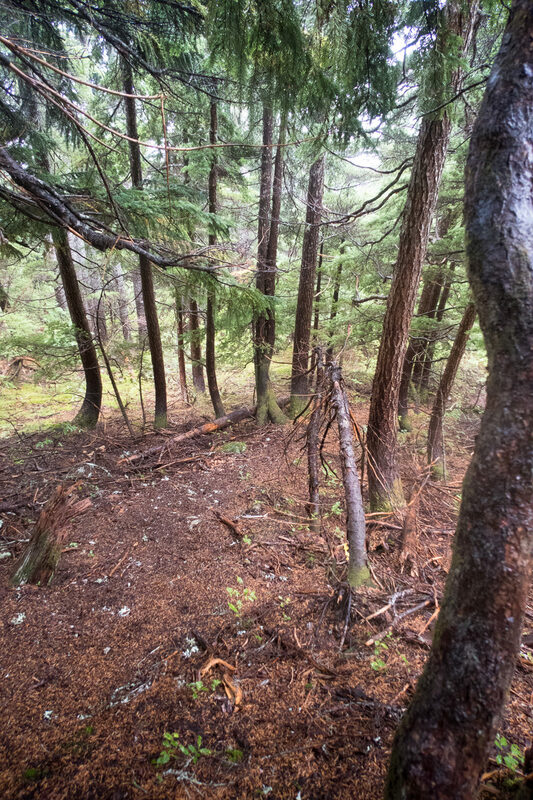 As we hiked the oldest sections of the forest, we noted falling ribbon and the obvious signs of a new planned road that will obliterate some of the best features of the existing trail.